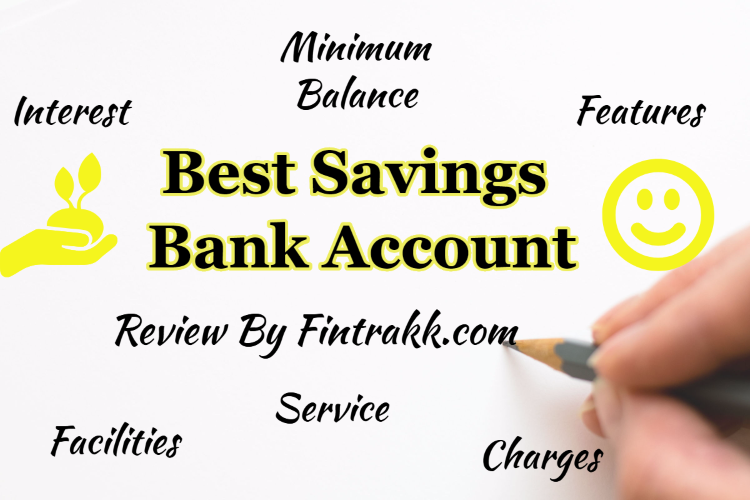 Through this blog we shall share details on Best Savings Bank Account in India. We have also compiled a list of Interest rates on savings bank account and various important criteria for selection of a savings bank account. Savings bank account,one of the basic and simplest way to keep your money securely. Each one of you might be having a savings account for sure. If not,some of you might be planning to open a savings account. A simple short answer to this question is: To keep your money safe. Keeping your money at home will not serve any purpose or fetch you any interest. Moreover, after the demonetisation drive, it is anyways advisable to put even a small part of your savings in a bank account. You can easily transfer and reinvest the amount deposited in a savings bank account as per your financial objectives. For security of your hard earned money. For earning a fixed rate of interest on the amount deposited. For liquidity, so that you can withdraw money and use it as and when need arises. It is probably the simplest mode of investing your money and earning fixed returns thereon. These days banks offers online banking facilities where you can easily transfer amounts whenever required. You can give standing instructions for auto payment of bills and auto debits for certain transactions in a hassle free manner. Regular Savings Account: A common basic savings account used by an account holder following the basic terms and conditions of the bank. Salary based Savings Account: These are normally opened by Companies for their employees, where the salary of the employees is transferred on a monthly basis. Savings Account for Senior Citizens: These are similar to regular savings account, but offer higher rate of interest and certain privileges to senior citizens. Savings Account with exclusive benefits to women: Few banks offer these type of accounts where exclusive benefits and features are provided to women. Savings Account for minors: These accounts are opened by parents/guardians on behalf of their children. Zero balance Saving Account: You are not charged any penalty on such account, if the balance falls below the minimum limit. Now, coming to the point, the next step is to decide the best bank to open Savings account. You need to consider few important points to decide Which bank is best to open Savings Account? Keep in mind all these crucial points before deciding the best bank to open savings account for yourself. This is the first and foremost criteria that we normally consider while looking for a savings bank account. We prefer opening a savings bank account with a bank that offers higher interest rates. ALSO READ 11 Best Personal Finance/Investing Books for You to Read! Majority of banks provide interest rate on Savings account at 4% only. Few banks may provide a bit higher interest rate at around 5-6%. Some banks also provide high interest rates beyond a certain amount of daily balance in your account. e.g. If your daily balance is above Rs.1 lakh they might offer you 5% interest or even higher as per bank norms. The interest is usually credited in your account at the end of every quarter: 30th June, 30th September, 31st December and 31st March. If you are the one who has to maintain a large balance in your savings account, then you should prefer banks offering higher rate of interest, to get good returns. But, if you wish to maintain a nominal amount in your bank account and diversify the rest of your money, you need to consider other factors as well. Note: Recently some of the banks have reduced the saving account interest rate to 3.5% only. Some banks like Yes bank still offer a good interest rate on your savings amount. Important: You can avail a tax deduction under section 80TTA on the interest earned on your savings bank account upto a maximum of Rs.10000. Now, you might be thinking…Which bank offers the highest interest rates? and Which is the best saving bank account? Go through our list of Interest rates on Savings bank account in India as given below. There is a minimum balance that you need to maintain in your account, so that your account remains active. Private sector banks generally require to maintain a higher amount of minimum balance as compared to Public sector banks. If your balance falls below the minimum limit, the bank charges maintenance fee for the same. The average monthly balance requirement can vary from a minimal amount to as high as Rs.10000 or Rs.20000 or even a higher amount as per their rules. This is based on the type of account you open and the bank where you open the account. So, if you can afford to maintain a particular balance in your account, this should not be your primary concern. These days almost all banks offer similar facilities like debit card, credit card, ATM access, net banking facilities,mobile banking etc. However, talking about online facilities, banks like BOI, ICICI, Axis are good. But, as far as physical reach is concerned you might see that SBI has more no. of physical branches. A bank offering better facilities and prompt customer support is anyways a preferred choice amongst individuals. Generally,private banks have an image of offering better services and customer support. However, there can be few exceptions to it. Even if banks provide online facilities these days, but there might be cases where you might need to visit the branch offices. In such a situation, good customer support and helpful staff is an added advantage for you. Banks usually charge for any extra service offered like cheque book issue, minimum balance not maintained etc. So, you should clarify about any hidden charges beforehand. This is not a major concern. But, a bank having substantial number of branches all over India will be more beneficial in case you are a frequent traveller. So, if you relocate from one place to another,this will make life easier for you. A nearby ATM is surely an added advantage for you. You should checkout for yourself, what are your priorities and consider these important criteria before opening a saving bank account. These are not in any particular order. Your choice may vary based on your requirements, location, purpose, services offered and so on. The above list has been prepared on “as is ” basis, there might be changes in the above interest rates of different banks from time to time. Do check with the respective banks and their branches before opening a saving bank account for yourself. Important: Recently some of the banks have reduced the saving account interest rate to 3.5% only from the previous 4% interest rate. If earning higher interest is what you are looking for, then Yes Bank and Kotak Mahindra Bank offer a better interest rate. This might be a good choice for you. If you look for location and number of branches, State Bank of India or SBI is a decent choice. It is a Public sector bank and does not have a minimum balance requirement as well. The customer support is also good in various branches. I don’t know about other private banks, but through my personal experience so far, Yes Bank ranks pretty well when it comes to getting the best services and a great customer support. You generally get a quick response to all your queries through the friendly customer support that these bank offers at their various branches. Other banks also provide good services, you need to see which one will suit your preferences. Kindly note that these are personal opinions, however individual preferences may vary from person to person. Ideally, a common man should be looking for a nearby branch providing good customer service and great net banking facility as well. However, this may vary as per your individual requirements. So, firstly make sure, you want to go for a higher interest rate only or you want to have a look at other important deciding factors as well. Note: Before opening a Bank account, do checkout the interest rate, minimum balance requirement, feasibility and variety of services offered and any charges thereon. Have you decided which is the best savings bank account based on your needs and priorities? Feel free to share your individual experiences with different banks. Your valuable feedback shall be much appreciated and would be of great help to our readers. Keeping a large sum of money in a Savings bank account is not advisable due to the low returns that you get on it. You should anyways look forward to diversify your funds to explore higher returns and invest your money wisely in other long term investments. If some one wishes to be updated with latest info then he must pay a quick visit to this web site and be updated daily.Thanks. This is a good list of banks for one to go through for a savings bank account !! Yes bank and Kotak offer the best savings interest rate. The Services are also good for Yes bank. But, IDFC bank account is quickest to open saving bank account and has good customer support plus some added benefits. These days people have so many good options to open Bank Account. Good Summary ! Yes bank offer best rate of interest on saving account . Thank you for your informative post.Currently I am staying in new location other than the address present in my address proof documents (Passport, Voter ID, Aadhar card etc).Please let me know which bank will allow me to open account in current location with old address proof. SBI charges more as service charges and requires Rs.2000 as minimum balance.Let me know please, which bank is good for less than Rs.1000 minimum balance and less service charges. Thank you for the list, its very helpful.If you don’t want interest at all and not interested in giving interest as well plus you need a bank with online services and low minimum balance, which bank is the best option in this case. Please reply. Hi, I can understand why you don’t want to take the interest. But, isn’t it possible if we take that interest money and help someone or help the community, just my opinion. Thanks for the detailed info on Savings bank accounts. You have highlighted some really valid factors.But,the reduction in interest on saving bank accounts is really a point of concern.This will drive people to move their savings to a better place like invest in mutual funds,ELSS and other schemes etc. in order to get high returns. Digibank by DBS provides the highest interest rates of 7%.Yes Bank & Kotak provide 6% only. That depends on your balance. If u are maintaining more than Rs.5 lakh balance then Kotak Bank is the best option. The list of bank names that you have provided is very good. It is really very helpful for people who want to earn more interest from their savings bank account. I prefer choosing a bank with minimum balance requirement. Holding too much balance in saving account doesn’t look to be a good idea. I usually transfer money from savings to other investment alternatives. Very Informative article on Savings account in India.